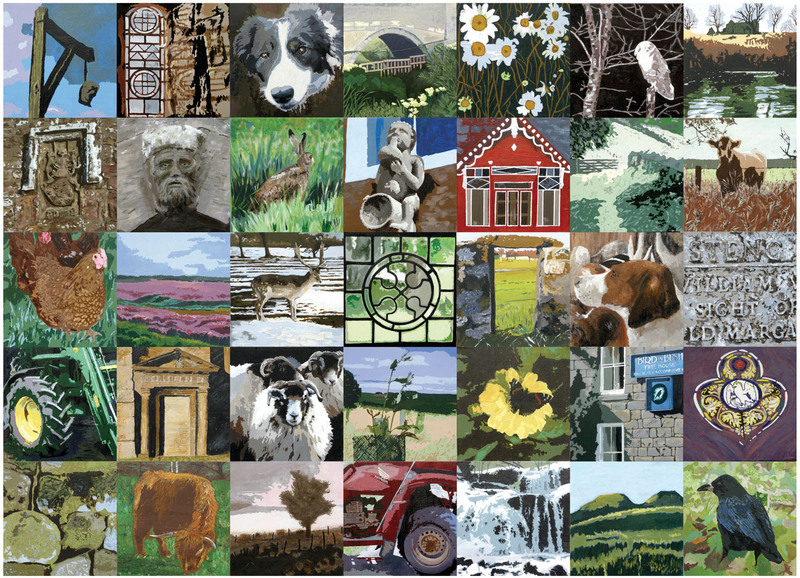 This is my last post on the Elsdon art project blog, so it’s an opportunity to say thank you to everyone who joined in with the photography and the painting. I’ve enjoyed it immensely and I’m really proud of our picture. I’ve just finished writing a brief report documenting the whole process of the project. I shall hand it in to the Village Hall Committee. It will be there for anyone to read if they’re interested. I hope that the next community artist will find it useful. The postcards are on sale in the entrance to the hall, and Marion is asking, at her next meeting, for them to be available in the Church . I’ve also written to the Otterburn Mill making the same request. Ian White has kindly agreed to collect in the money and to replace the cards as they sell. We had to work very quickly after the village painting exhibition, to change the layout of the hall so that there was a distinctive area for each of the five artists. The display boards were useful both as dividers and also for the display of the light weight work. Sarah’s work was displayed on one of the large tables as her pieces are fairly small and three dimensional. 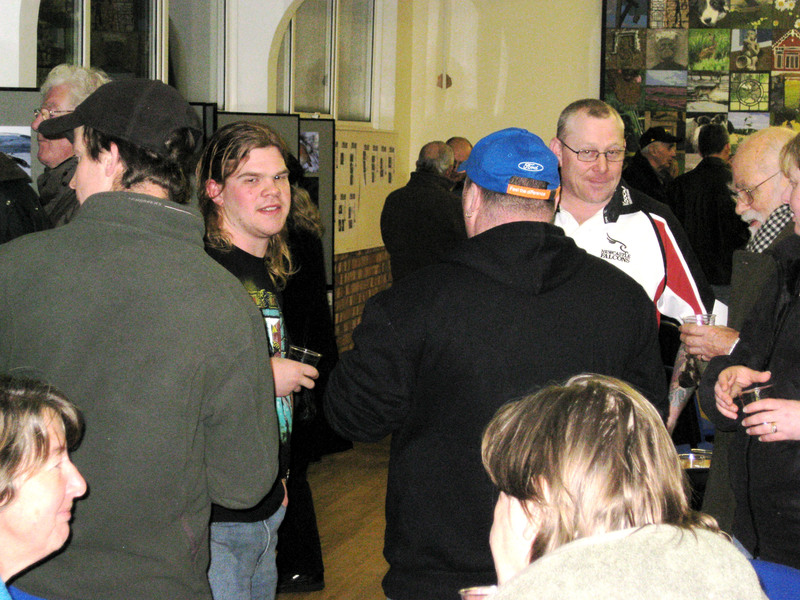 Tessa travelled north to take part in the exhibition, and helped to look after the gallery on the Friday. The rest of the time was shared by Carolle, Sarah, Keith and Shirley. Quite a few of our friends and people from Otterburn as well as Elsdon came along to see the work. The art group from Longhorsley, some of whom had taken part in art courses at Carolle’s studio, came and also had lunch at the Coach House. 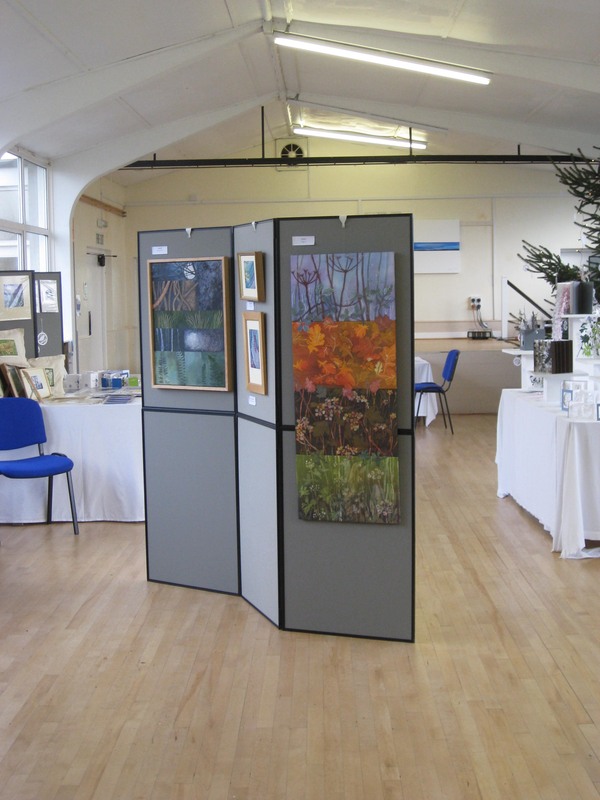 We all felt that the hall was very successful as an exhibition space. The experience made us think more about the lighting, and the need for spotlights on the village painting and also around each wall so that they can be directed onto pieces in future exhibitions. Another suggestion, from Keith, is for three sizeable free standing display boards that can take heavier pieces. It is so good that this exhibition of art by local artists should have grown out of the village art project. We are hoping to repeat our connection with Network Artists and put on another exhibition in June. Thank you so much for coming to the Open Evening, it was such an enjoyable event. Thank you to the Bird and the Coach House for providing us with generous amounts of tasty treats to eat with our glasses of wine kindly donated by Tessa and Paul Priestman. Thank you for the background music courtesy of Brenda Heslop and Laura Hewison. I’ll be putting up more photos in the village hall as soon as I’ve printed them out. It was a great idea to have a raffle and also the “guess the weight of the sheep” which continued for a week or so in the pub. Many thanks to Robert Arthur for that one. If anyone sees our photo in the Courant, please keep a copy and display it in the hall. 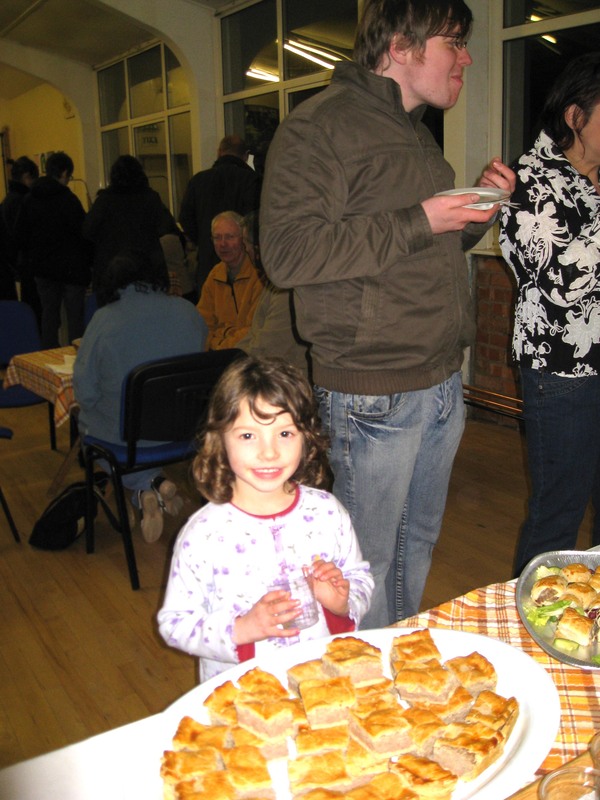 Don’t forget to come along to the Village Hall for the open evening, from 6 – 8 pm. Drinks courtesy of Tessa and Paul and food provided by the Bird in Bush and the Coach House. The painting is now installed and we will be selling a postcard and booklets about the painting, the profits from which will go to Village Hall funds. 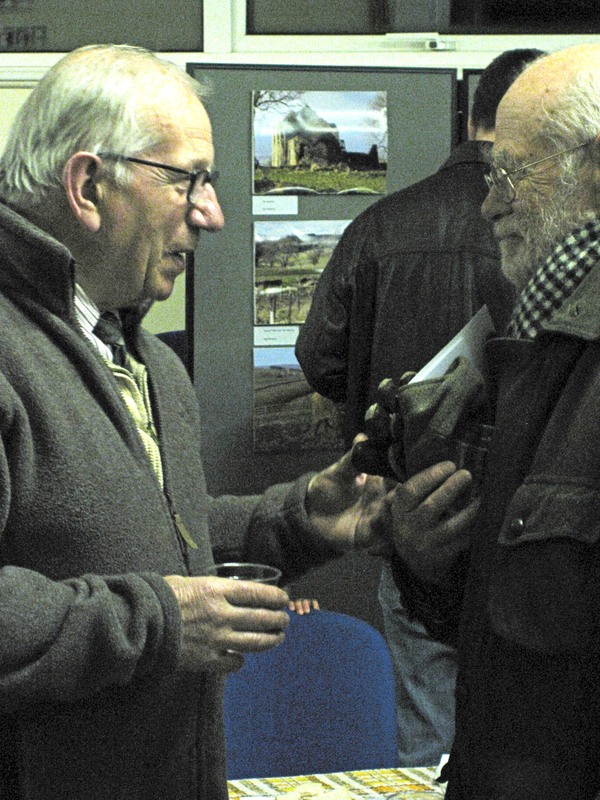 I would like to thank the Northumberland National Park for additional funding which has helped with the expenses of the open evening and costs of producing the booklet. 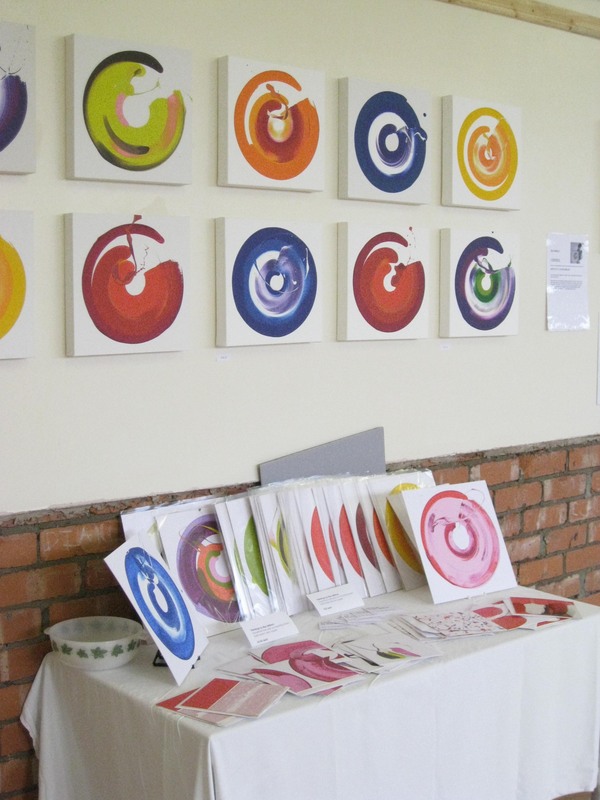 The exhibition will begin with an Open Evening on Thursday December 3rd from 6.00pm in the village hall. Everyone is invited to come and look at the paintings and photographs and to have a glass of wine or juice and some nibbles. Tessa and Paul have very kindly provided us with red and white wine. If anyone would like to help by bringing some crisps, nuts or other snacks it would be much appreciated. All the paintings are complete now and are arranged in their final composition. Peter Simpson is about to make a start on the frame and Sarah has helped me to design a postcard with the complete image on the front which I have just emailed to a printer. I thought you might like to see a couple of the pictures that were last to be finished. Here’s the sheepdog, and there’s also one (at last!) of the village pub. A press release and a copy of the painting has been sent to several newspapers and magazines to publicise our painting and the exhibition. The painting and displays of photogaphs etc. will continue to be on show on the Friday, Saturday and Sunday, December 4th – 6th during the day from 10.00am – 4.00pm. Please tell all your friends. Most of the pictures are complete, five need to be finished, (mainly Sarah’s !) and we are concentrating on those this week and next. Peter Simpson, who has already helped the village hall by working on some of the renovation projects, has offered to join the canvasses together and to build a frame around them so that they can be safely fixed to the wall in the main part of the hall. When that has happened, Sarah and I will photograph the painting and start designing the catalogue and leaflets. Alison Simmance has been working very hard on the text that will accompany the images . She has written some very descriptive and evocative passages about the subject of each painting. Lists of all the people who she has spoken to and who have helped her in her research will be included as well as those who have been involved in the photography and the painting of course. I have started to print out some of the beautiful photographs that people sent me for the project so that we can have a photography exhibition showing at the same time as our painting exhibition. Watch this space for the next up-date ! Most of the thirty five paintings are complete now. The deadline is the end of this month. That gives us two more weeks to finish the rest. Thank you to everyone who continued to paint this week both in the hall and at home, and to Allison who is also working hard researching and writing up the information that will accompany the photos of the paintings in the booklet. If anyone has information about the village that Allison might like to include in her written notes, please let her know as soon as possible. When all the text is complete, Sarah and I will work on the layout of the booklet and pamphlet. The paintings themselves will be fixed together and framed with wood. We hope for all this to be in place sometime in September ready for our community art and photography exhibition.